If you only make one change to your skincare routine, try this. Face wipes are notoriously drying and played havoc with my skin. I swear by Lush Ultrabland to remove my make-up - this stuff is amazing. Each evening I'll smear the rich, butter-like cleanser over face (including my eye area – the formula doesn’t sting and removes even the most stubborn waterproof mascara) and remove with a hot muslin cloth. What I like most about this cleanser is how soft the almond oil formula leaves my skin, it's almost a cleanser and moisturiser in one. In the morning I prefer to use a face wash to clean my skin. At the moment I’m a big fan of Ren’s Clarimatte™ T-Zone Control Cleansing Gel. This is a purifying, antibacterial cleansing gel that washes off easily, which is ideal when I’m in a hurry (always). It's my go-to product when blemishes crop up. In the past year I have noticed the skin around my eyes starting to look a bit tired (too many late nights, YOLO). Early nights will never be my forte, so instead I’m incorporating an eye treatment into my routine. The product I really like at the moment is Ren Vita Mineral™ Active 7 Eye Gel. 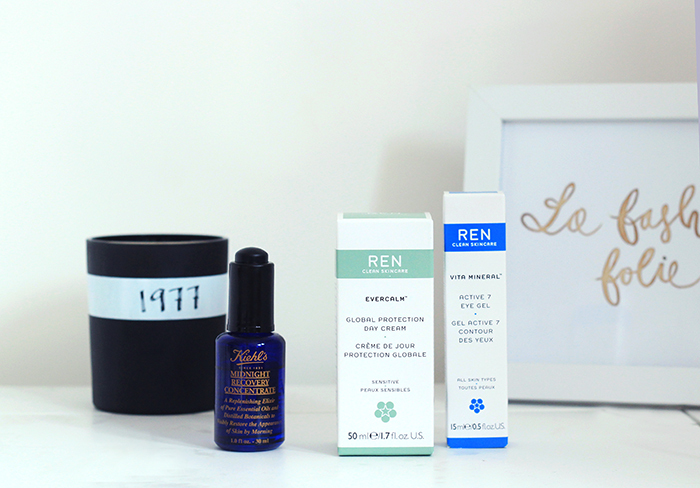 Ren promise this product will leave the eye contour looking brighter, smoother, and firmer. I've only used the gel for a month but I can definitely see an improvement - the skin around my eyes looks generally brighter. And being a gel it’s non-greasy and absorbs quickly, so I can slap it on under make-up, too. 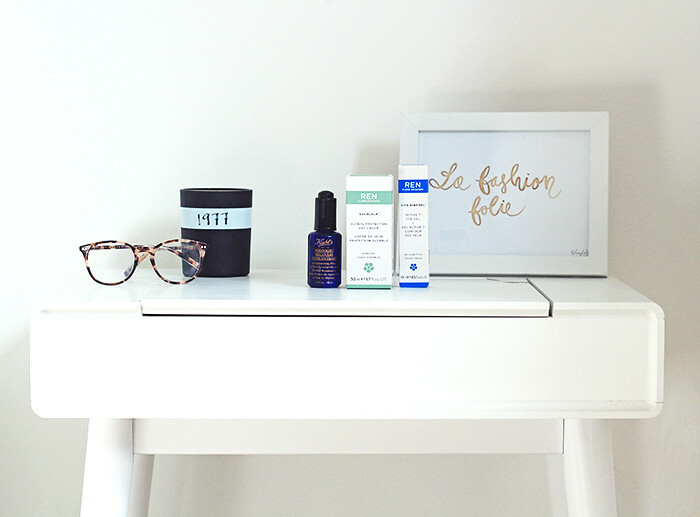 If you’ve ever suffered from breakouts, face oil can seem pretty scary. As teens we were taught that grease = spots, but that’s not strictly true. A good face oil will not clog pores, and is an extremely effective moisturiser. 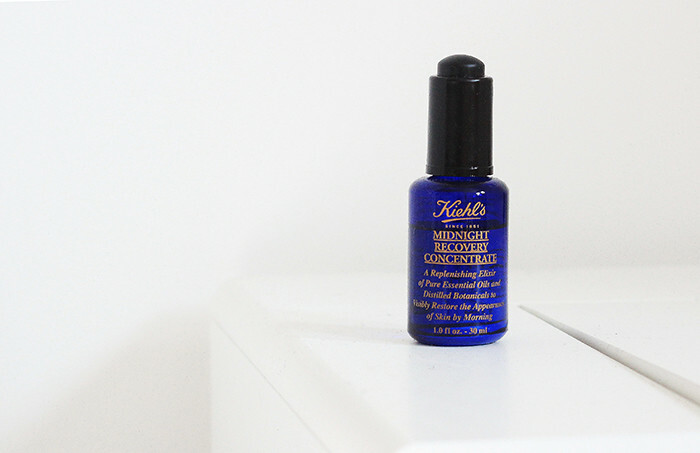 The product I keep returning to is Kiehl's Midnight Recovery Concentrate. It’s not cheap but you only need to use a couple of drops at night in combination with your night cream. You wake up with really lovely glowy skin the next day, and I promise it doesn’t cause spots. This one is basic and it’s very hard for me to stick to given my genetic make up is 50% espresso. Sadly all those caffeine fixes leave skin dehydrated, which is extremely ageing. I’m currently making an effort to swap coffees for ginger tea (my favourite is Three Ginger by Pukka) which is also very good for digestion. That combined with a lot of water definitely makes my skin noticeably sprightlier. I’ve been reluctant to use anti-ageing products up until now. However, my frown lines are getting deeper by the day, so I’ve caved. 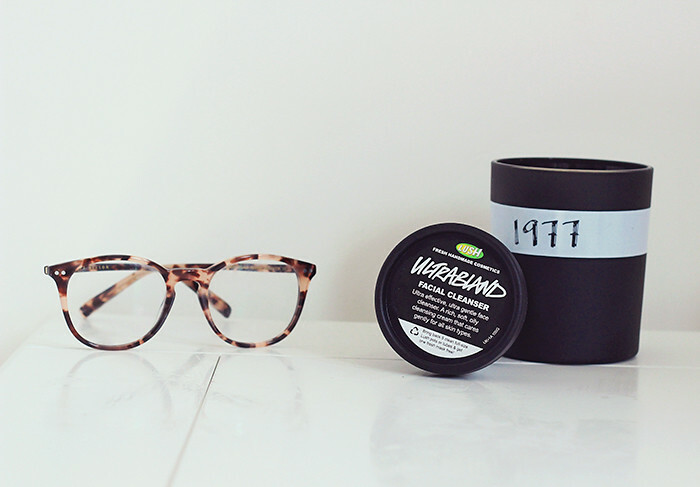 Currently I’m pretty obsessed with a Ren's Wake Wonderful Night-Time Facial cream. I apply two or three pumps to my face and neck at night (it tingles slightly which is very satisfying) in combination with the Kiehl’s concentrate. Now, I’m no dermatologist, but what I can say is that my frown lines are definitely looking less obvious, which is great news. 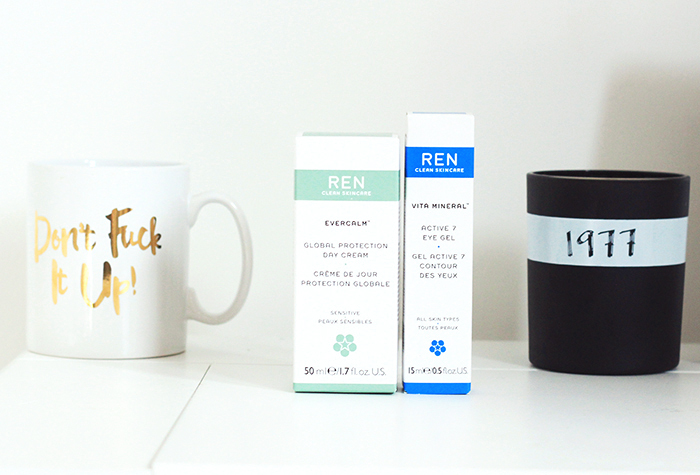 I also use Ren's Evercalm Global Protection Day Cream under my make-up as a base. This product is recommended for city-dwellers as it contains Omega 3 and 7 oils that work to boost the skin’s lipid content, restoring moisture and providing a natural barrier against pollution and irritants. In essence, it's a moisturiser with a whole heap of added benefits. Please do share your skin care tips and favourite products, I'm always on the lookout for recommendations!